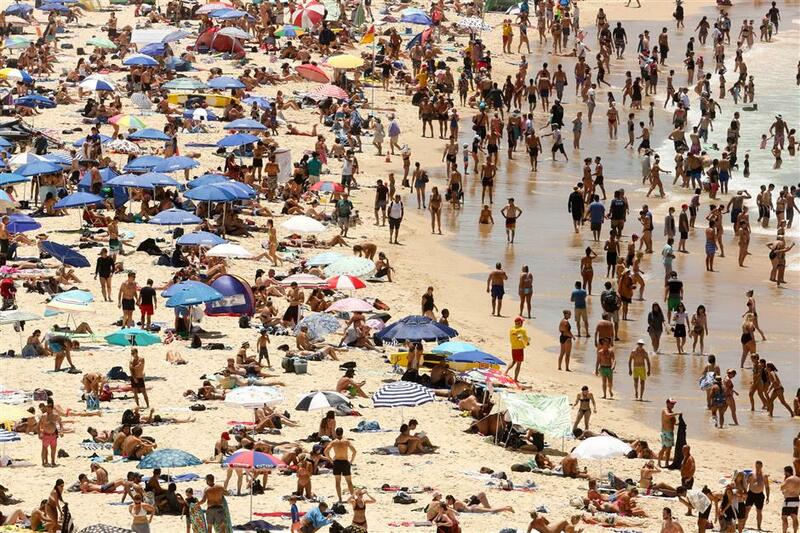 Sydney sweltered through one of its hottest days on record Sunday as temperatures soared in southern Australia and authorities imposed a fire ban in a sizzling start to summer. Beachgoers sit and walk in the water at Sydney's Bondi Beach on a hot summer day in Australia, January 7, 2018. Australia's largest city recorded its hottest day since 1939 as the mercury rose to 47.3 degree Celsius (117.14 degrees Fahrenheit) in the western suburb of Penrith. Top tennis players were called off the courts Sunday at the Sydney International, a warm-up tournament for the Australian Open Grand Slam, after thermometers recorded temperatures over 40 degrees Celsius. "43degrees but probably 50 on court when started. I'm sorry to the fans. I think it's 1st time in my career I retired a match..it says it all," the world number 11 tweeted. Total fire bans were imposed to reduce the risk of bush fires, which are common during Australia's arid summers. Numerous blazes had already sprung up on Saturday, with several homes and buildings lost in bush fires in the states of Victoria and South Australia.